A quick look at the chart shows 1894 Morgan silver dollar value of coins struck at the Philadelphia mint are rare. Your 1894 dollar is one of the least encountered years of all the Morgan series. A date highly sought by collectors. 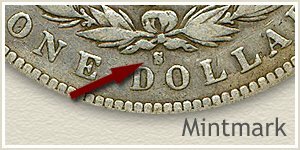 Regarding value, it's important to determine the mint that struck the coin. Three different mints produced silver dollars in 1894, two used "mintmarks" to distinguish their coins. Flip to the reverse of your coin, the space above "Dollar" contains an "O" an "S" or is empty. A complete description of mintmarks with a close-up image of their location is found further down the page. Also very important to silver dollar values is condition. This needs careful study. The amount of wear or the lack of it is judged on each coin and a "Grade" is determined. Values are awarded according to these classifications. A nice example of a top grade is the 1894 dollar pictured. Worth a premium, this "uncirculated" coin was never used and remains free from wear. How high on the value chart does you coin rank? Accurate 1894 Morgan silver dollar value is the combination of determining the mint that struck your coin and equally important, judging condition. Most dates in the Morgan series are valued higher when a mintmark is present. 1894 is different. Silver dollars minted at the Philadelphia mint, which did not use a mintmark, lead in value and rarity. The remaining mints, San Francisco used a small "S" see image. New Orleans used an "O" as its mintmark. You would find either of these on the reverse just below the knot in the ribbon. Huge numbers of collectors have made their presence known in the Morgan dollar series. In a quest to complete date and mintmark collections they have pushed values for certain coins to multiple thousands of dollars. Your 1894 certainly represents how scarcity and demand controls value. There are just not enough 1894 Philadelphia mint silver dollars to meet the collecting needs. Current values indicate surviving numbers of high condition coins is outnumbered by collectors. Coin market in action is represented by the bidding results of this 1894 silver dollar at a David Lawrence Rare Coin auction. Featuring a popular "look" the coin pictured exhibits a continuous layer of "frosty" white luster. This heavy luster is often referred to as frosty by collectors to indicate depth of texture. Quality of strike also rendered a wonderful eye appealing Morgan silver dollar. Bidding tracked upwards until a final price of $5,800 was necessary to purchase the coin. It was a classic supply-demand result that demonstrated strong support of 1894 Morgan silver dollar value. 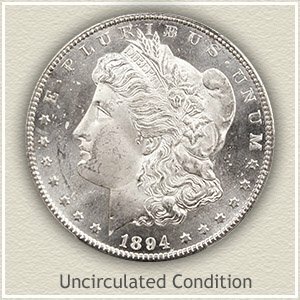 Follow along with the images and descriptions as a Morgan dollar begins to wear from freshly minted "Uncirculated" condition, to a very worn example in "Good" condition. By judging the different stages of wear, a "Grade" is determined. The greater the detail visible, the greater your 1894 Morgan silver dollar value. Uncirculated: A silver dollar in the "uncirculated" grade never saw use in commerce. Your coin must not show any signs of wear and retain the look of brand new, often with natural toning that occurs to silver coins. Look for the first signs of abrasion from wear on the highest part of Liberty's cheek below the eye and the front of her chin. Wear to the surface removes the delicate texture of original mint luster leaving these areas dull. 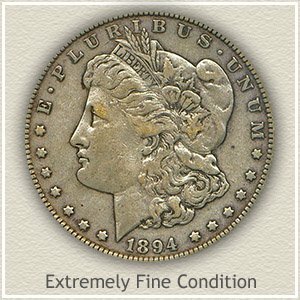 Extremely Fine: Slight but obvious removal of design and metal defines a worn silver dollar in "extremely fine" condition. Mint luster is now gone from the large exposed areas, the field in front of Liberty and her face. Small details in her hair are now missing, most noticeable above her forehead and behind her neck. Also the folds in the cap show wear on the highest parts, the result of use and handling. This is a nice coin, with solid 1894 Morgan silver dollar value. Fine: Once distinct and well defined features of Liberty are now reduced by moderate wear, lowering the grade to "fine" condition. Leaves surrounding the cotton blossoms are only outlines lacking inner detail. Many finer strands of hair have worn to the point of combining into larger flattened areas. Your silver dollar gives the impression of wear but not excessive. 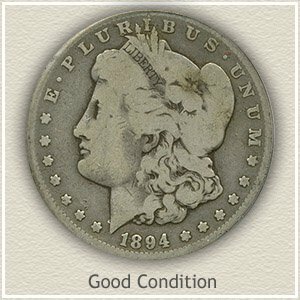 Good: If your 1894 silver dollar has endured extensive wear it is described as "good" condition. Despite a large loss of detail Liberty's portrait is clearly separate of the field. A few lines of hair curls show behind the base of her neck. Although heavily worn some folds to the cap are visible. A once protective rim is now all but gone and close to merging with the lettering. Every collector admires these majestic silver coins, every collector wants one. Their popularity is immense. Any date is worth over $17.98 each because of silver content alone. Check your coins with the grading images and value charts. 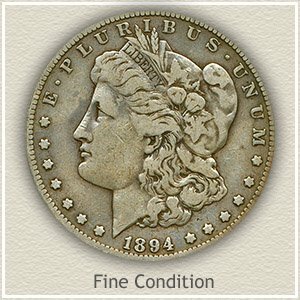 Find a rare date, mintmark or a better condition coin and Morgan silver dollar values start climbing. Check all your Silver Dollar values with the coin value chart, separating the common from the rare. From the early Bust and Seated Liberty Dollars to Morgan and Peace silver dollars. Rising silver prices, increasing demand from both collectors and rare coin dealers requires a second look at your old coins. It is an excellent index with images and text links to all coin series, from Cents to Gold. 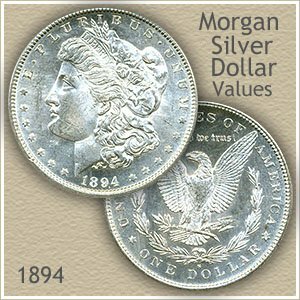 Value charts, grading images and descriptions uncovers 1894 Morgan silver dollar value also all common to rare coin values found in your box of old coins.